I love to step back and allow my children the opportunity to build a relationship with people from the Bible, just like the Charlotte Mason method speaks about. These have been a resource we have used in our home for nearly twenty years. Our family has loved The Animated Stories From the Old Testament since 1998. My children still relate the Bible to the stories they grew up learning and now my younger boys are blessed to be enjoying the interactive DVDs, since we upgraded our worn out VHS series at Christmas. 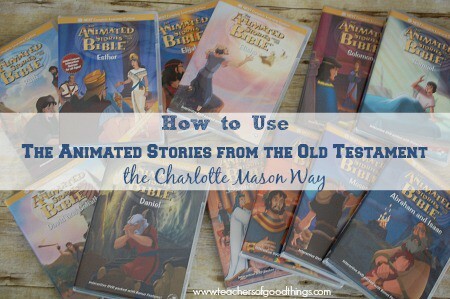 Because of our love of these animated stories, I wanted to include these in the Review Series and show you how to use the Animated Stores from the Old Testament the Charlotte Mason Way. Each DVD comes with an interactive section that gives Bible trivia questions based off the story they just watched, helping to see what is retained. They also have a section for printable resources that includes coloring pages from scenes in the Bible and games to engage them more into the story. We use these for our Bible curriculum. These are Biblically accurate and teaches so much in a 30 minutes DVD. I love allowing my children to choose which one to watch and often times, they will watch the same one again and again, proving the power of the animations, as they are retaining so much from their viewing. Reading the scriptures where the story takes places, demonstrates to them just how accurate these DVDs are and they will take joy in learning them. Preschool aged children can find it easy to narrate these stories of Daniel, Joseph, Esther, David, Moses and more! With excitement, they will tell you so many aspects that just reading wouldn't be able to give them. The different forms of narrations will be perfect for your children of all ages. You can have them do oral narration, do a coloring page from the story, have your child(ren) act out their narration in a skit or have them play with Lego people to retell the story. Learn the Biblical locations of where the story takes place and use the Deluxe Then and Now Bible Maps to find its location then and what it is called today. Print a map for them to color and add to their Binder Book or notebook. Learning the history that surrounds the stories from The Animated Stories of the Old Testament is a perfect way to get older children learning alongside your younger children and giving them additional assignments to get the full picture of the story. In the story of Daniel, we see that he is taken captive and becomes a slave. Why? What caused this to happen? Who was responsible? When did this happen? How did this fit in God's plan? In the story of David, we see the Israelists being challenged by the Philistines. Why? What caused this war? Who was the king of the Philistines and the King of Israel? When did this happen? How did this fit in God's plan? Highlight some of the scriptures from the story in the Bible to be used for copywork. Get them involved in the story, while copying the words of scriptures that pertain to the story that they are learning. I hope this helps you see the potential in using these resources for curriculum and giving your children the love of the Bible! I offer additional suggestions of some of the best stories for your sons and for your daughters to learn.